for $494,000 with 6 bedrooms and 3 full baths, 1 half bath. This 3,902 square foot home was built in 1995 on a lot size of 5.0080 Acre(s). This immaculate home has it all!! 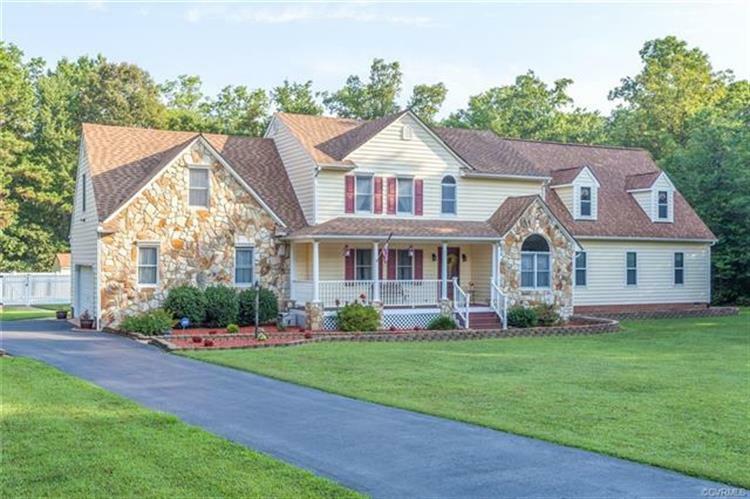 5 acres of land, private lot, in ground pool, handicap accessible in-law suite, 2 car attached garage, 40 x 42 detached work shop with electric and water, small pond, paved drive with huge parking area, large deck, country front porch, and whole house generator. Low maintenance exterior with vinyl siding, vinyl pool fence, and vinyl rails. The interior features formal rooms with hard wood floors, updated kitchen with oak cabinets and granite, 2 story foyer, spacious family room with stone propane gas fireplace. Master + 3 additional bedrooms on 2nd level. Master bath has just been renovated with large walk-in shower featuring Terra stone finish. Huge rec room is also located on 2nd level. The in-law suite has handicap wide pocket doors, kitchenette, living room area and 2 bedrooms. Carports do not convey. All appliance convey including washer and dryer. This is an awesome home for entertaining & enjoying country life yet close to Chester or Colonial Heights. In-law suite could be a 1st level master bedroom, or is perfect for individual with handicap needs. Separate driveway to workshop from Cattail Rd. Downstairs heat pump has propane gas back up.